Fiona Griffiths has been tasked with two things: passing her sergeant's exam with flying colors and logging evidence to help fill in for someone on medical leave. She couldn't be less concerned about her exam, and the monotony of evidence tracking is driving her around the bend. In desperation, she goes to her boss and is given a big stack of cold cases-- anything to keep her quiet. But as Fiona goes through those cold case files, she begins to piece the tiniest of clues together. A marine engineer found hanged in a locked apartment. A security guard found dead at the base of a cliff in Wales. Artwork that's stolen and then mysteriously returned. What connects the three? Only Fiona believes they are connected, and in her usual inimitable style goes about piecing the facts together to prove that she's right. Her investigating is going to bring her right into the heart of darkness, and her journey is going to be the ultimate test of her mental toughness. Whenever I see those "all-time favorite" book lists, I avoid them like the plague. I just don't feel like putting all the books that have touched me deeply into an organized and rated row. (Yes, it is a lot like asking a mother to name her favorite child.) However, if someone asked me to name the best mystery series being written today, without hesitation I would say Harry Bingham's Fiona Griffiths. To date, there are four books, and I have given all four the highest possible rating. I can't say that about any other author I've read. Yes, the setting of Wales adds texture and richness to the books. Yes, the mysteries are some of the most intriguing you'll ever come across. Yes, the pacing draws you inevitably forward, faster and faster. You have to know what happens, and you have to know now. But the best and brightest thing about Harry Bingham's superb series is the main character, Fiona Griffths. At one time Fiona suffered from Cotard's syndrome, a rare mental illness in which an afflicted person holds the delusion that they are dead, either figuratively or literally. Fiona is one of the brightest people you'll ever run across, but Cotard's syndrome has colored every aspect of her life, and most especially in the way she interacts with other people. 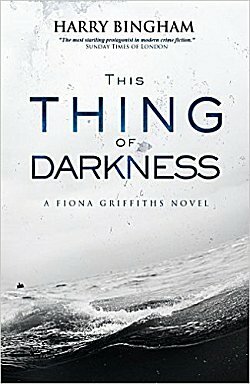 As can be seen in This Thing of Darkness, Fiona now has two superior officers who--though they may not really understand her-- can see her almost limitless potential as an investigator. To the best of their ability, they are now trying to groom her for bigger and better things. Will Fiona cooperate? Your guess is as good as mine. I will warn you that this book does contain scenes of torture, and they do involve Fiona. They are tough to deal with but not impossible because we see these scenes through Fiona's eyes... those eyes that do not see the world as we do. There are also scenes of humor that bring needed warmth and laughter to the book, as when Fiona and Inspector Watkins conduct an interview together. As different as Fiona is, she can also be very familiar. When she says, "Just when I see a barrier saying Do Not Cross, I have an almost overwhelming impulse to cross it," I understand because I've felt the same way many times. Harry Bingham is the first writer who's been able to write scenes that take place on board ship that made me seasick, so be forewarned. He also made me nervous about a purchase Fiona made-- an uneasy foreshadowing of what's to come in book five, The Dead House? Unfortunately I'll just have to wait and see. If you haven't read any of the books in this series, I urge you to do so, and you need to start with the very first book, Talking to the Dead. If you do that, Fiona will make sense-- and then you will be as hopelessly hooked as I am. Fiona Griffiths is as wild and wonderful in her own way as Stieg Larsson's Lisbeth Salander is in hers. I can't recommend Fiona-- or this entire series-- highly enough. I'm really glad you enjoy this series, Cathy. And I know just what you mean about choosing a favourite child... I think I'll have to wait on this one until I'm ready for the troublesome scenes; I'm not one for torture in my crime fiction. But still, the story sounds excellent. The story is excellent, and the torture is handled very well... or as well as torture can be. It's wonderful, Kay. Please don't miss it! I always look forward to seeing what your first best read is when we are starting a new year. It looks like this is it! I did read Talking to the Dead due to your reviews. I must read the second book now. Thanks for introducing me to so many good books! You're so very welcome, Lynn! My Best Reads graphic will change soon because I've had my second A+ read to share with you all! This sounded so good I went and pre-ordered the first in the series for my Kindle. PLEASE let me know-- either here or in email-- what you think of it! This does sound like an interesting series. I agree that this is a good series. I've read the first two books. Will check the library to see if it has the third books. Now, this book is one I want to read but I deplore torture, especially with a character I like so much. So, I'll see, but I can always skip the worst paragraphs, something I've done, including with the Stieg Larsson books. I know torture isn't everyone's cup of tea, and it's not mine either-- ESPECIALLY with this character. Skip the worst bits, and you'll learn even more about Fiona.